When we mention Indian Ice creams, the first thing that comes to your mind is Kulfi. If you have lived in India, then you would not have escaped tasting the most mouth watering, delicious and tasty Kulfi. The lingering exotic taste of the essential flavors that go into the making of this exclusively Indian dessert gets you hooked on to it no matter where you are. Kulfi was introduced to India by the Mughals. ZeeFoods can offer the authentic back-home taste of kulfi right here in California. Using the highest quality ingredients, our kulfi is manufactured in the most hygienic environment. Exotically flavored kulfi is then enhanced with garnishing such as nuts, saffron and falooda. 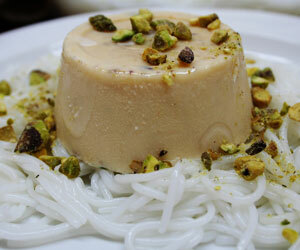 Falooda is soft noodles that taste best with Malai kulfi. Our delicious Falooda Kulfi is also garnished with rose syrup and chopped pistachio to offer you the most authentic kulfi you have ever tasted. We offer Falooda Kulfi only for catering as the topping is perishable and cannot be stored. If you are planning a party for friends, anniversary, graduation or wedding parties, just call us and we can offer several options to provide you the most delicious and amazing Falooda Kulfi. Visit us during the Festival of India Mela to enjoy this once a year public offering!